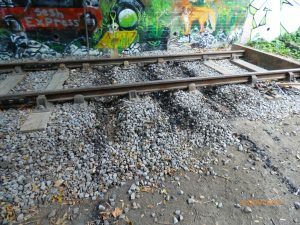 Unfortunately some of the sleepers on the railway track under Pilley Bridge were set alight and damaged recently. The AGM of the Friends group was held on the 14th July 2015. Financial report – Generally pretty healthy. Also it was noted that our memberships will soon start expiring, so we will need to initiate a rolling program of reminders. Major improvements to the paths, especially across the Meadow and to the steps. We get a lot of appreciation from walkers and it’s encouraging how many people, young and old, are now able to experience the place. The Board Walk – so many people go and sit on the benches and relax, and very few are anti-social. It has been a big success. The Community Orchard – continues to develop, botanically. I cannot see any reason to intervene in natural processes other than to tame the vegetation now and then. Each year different plants dominate and this year it is False Melilot. The newly established fruit trees are doing well and still look as though they are too far apart, which is good because we can be sure that they have not been planted too close together. 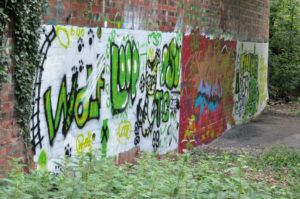 Below the Travis Perkins bridge: is it too soon to conclude that the general up-grading of the area is reducing the attractiveness of the area below the bridge for those of an anti-social nature? Up-grade the path from the far steps down from the Meadow, to the ponds. The plan is to get gravel delivered (probably 10+ tons at maybe £60/ton) and to hire a tracked barrow to move it. There are also some bits between the 2 bridges that would benefit from some gravel and we may be able to do this at the same time. We may start it on the September work party day. Also finish improvements to the steps. Raise the water level in the pond by a couple of inches by altering the level of the spillway. We had thought to do this during the summer when water levels were low, but have realised that if we raise the level now, it might take days for water to start coming over the spillway again – not good for the downstream pondlife. So it is probably best to wait until there is a bit more water, but not so much that it would prevent us doing the job. Swift and House Martin nest boxes – swifts and martins are getting scarce partly because of shortage of nesting sites. The west side of Pilley Bridge would be a suitable place for some nest boxes – just below a ledge that is more or less at the level of the carriageway. It would need scaffolding, or a very long ladder and nerves of steel, to fix them. This would be moderately high profile because everyone would be able to see them, and this time it would be principally for wildlife. Their educational value would also be high. Enlarge the Community Orchard: a little scrub clearance was done on the bank below the CO last winter but not as much as planned. It would be good to get one or two more trees planted to make it more of an orchard, and cut the bank more so that it becomes accessible, more grassy and open. Winter work. Up-grade the path across the Community Orchard. It’s not straightforward because of the need to incorporate routes for surface water. We haven’t quite worked out how to do it yet but reduction of the gradient at the entrance will use-up those untidy concrete posts. Watch this space. New glade: on the south side of the main drag up eastwards from the Community Orchard towards Pilley Bridge there is a spot on the right where a new glade to let in more sunlight could be created easily by removing the Ash saplings and a couple of Hawthorns. Winter work. Travis Perkins bridge bat roost? Cost maybe £1000. Since the last AGM a year ago a number of events, activities and projects have happened, as well as our regular activities. Each quarter a newsletter has been produced and sent out to our 204 members, mostly by e-newsletter but a number are still printed and taken round to each of our non-computer-owning elderly members. Photos and information are regularly put on Facebook and our Facebook members now total 175. Our website is regularly updated and a continual calendar of events is available for all to see. Each school holiday our junior members have Nature Explorers activity group run by Marta and Davinia. This is a very popular event with sometimes 20 or more children turning up with their parents. The first Saturday of each month sees the gathering of volunteers to do practical work in the reserve. This is improving the reserve constantly for wildlife and people alike. Both the Woodcraft Folk and the Beaver Scouts use the reserve for their activities on a regular basis. This January the Woodcraft Folk joined forces with our members for an evening of wassailing in the community orchard. In the Easter holidays we invited Simon Turk from Treecreepers Forest School to run a 90 minute fire making workshop for 6 – 11 year olds. This was very successful and something we may well instigate again. Last Autumn Morgan started up an activity called Wildish Playtimes to encourage parents to bring their pre-school children to the reserve for unstructured play and a lot of getting wet and muddy. This ran until the mud on the paths got too difficult for toddlers to manoeuvre. Because of lack of helpers we were unable to start this up again in the Spring but it was felt that lots of young families were visiting the reserve by this time so its need was not so great. 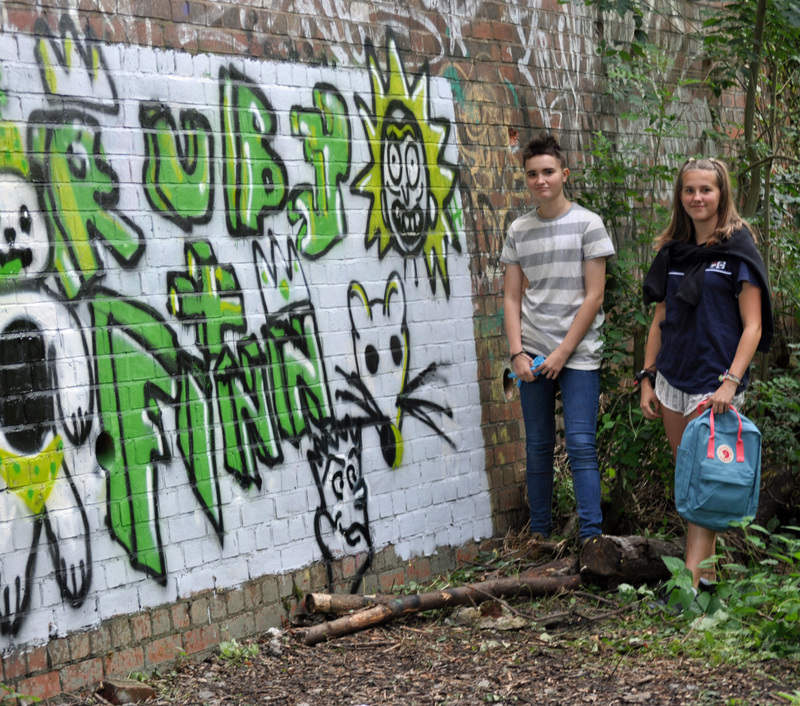 In June, Naunton Park School had their Art Week with the theme of Nature. 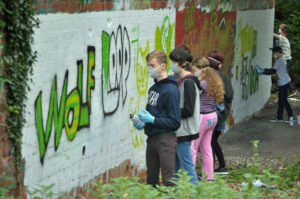 Each day classes came down to the reserve to paint, draw take photographs and be inspired by what they saw around them. 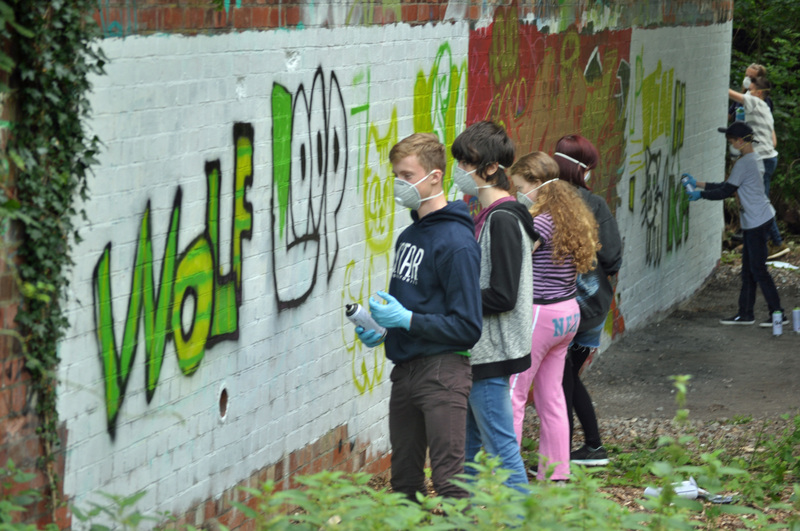 Several enthusiastic youngsters were seen later showing their parents what they had done. Last July saw our first ‘Community Summer Picnic’ with live music from David Lloyd, the Music Man’, children’s games and plenty of cake and tea. The atmosphere was one of laid back good will. On Apple Day there was another extremely well attended event in the Community Orchard. As in 2013, about 150 people came. The cakes were even more delicious this time and people were able to stock up on lots of lovely jams and pickles. Bunting, music and children’s games made this a really great community event. The long-planned addition of boardwalks to the wetlands area came to fruition this year after some super fundraising. The money from Community Pride and GCC Active Together gave us all the money we needed to get contractors in and complete the job in January this year. The work was supervised by Friends Group members and we were pleased with the way they did the job and the response from people using the reserve has been universally positive. The pond is now being gradually planted up using plants transplanted from other parts of the wetlands so as to improve the habitat for pond life. The work parties have built new paths that make it possible to cross the Meadow easily in all weathers and the steps are being up-graded to make it easier to get up and down. It is anticipated that the access paths will soon be improved and the funds are available for this. During the winter we had two very interesting and well attended talks and community curry evenings at Mel’s Café; hopefully we can find more speakers to give similarly high standard talks this coming winter. Our membership continues to increase, indicating a real keenness by the local community for their local nature reserve. Within the reserve the management of the trees and the added light due to thinning has increased the wildlife diversity and is generally popular with walkers. A wider range of plants are flowering, more butterflies, birds and wild flowers are being seen and monitoring of these changes is being undertaken by a few keen individuals. There is a project in the pipeline joining with Naunton Park and the Asquith Road Allotments to have a professional survey and comparative study done of pollinators on all three sites. The habitat piles we have built out of the cut wood are being slowly colonised with an appearance by hedgehogs this summer. 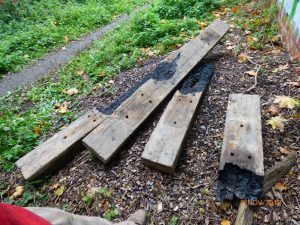 The badgers are building new sets close to the ponds, obviously not at all put off by our new boardwalks and although muntjac tracks are often seen by the water they seem to keep themselves mainly hidden in the Wild Wood area. Plans for the coming year include swift and house martin nest boxes, raising the level of the big pond, enlarging the community orchard, continuing up-grading paths and creating a bat roost. During the week of 1st February 2015, R. J. Clarke, the local landscape contractors selected by The Friends of Pilley Bridge Nature Reserve (PBNR), installed the board walks and footpath bridges at the Nature Reserve. 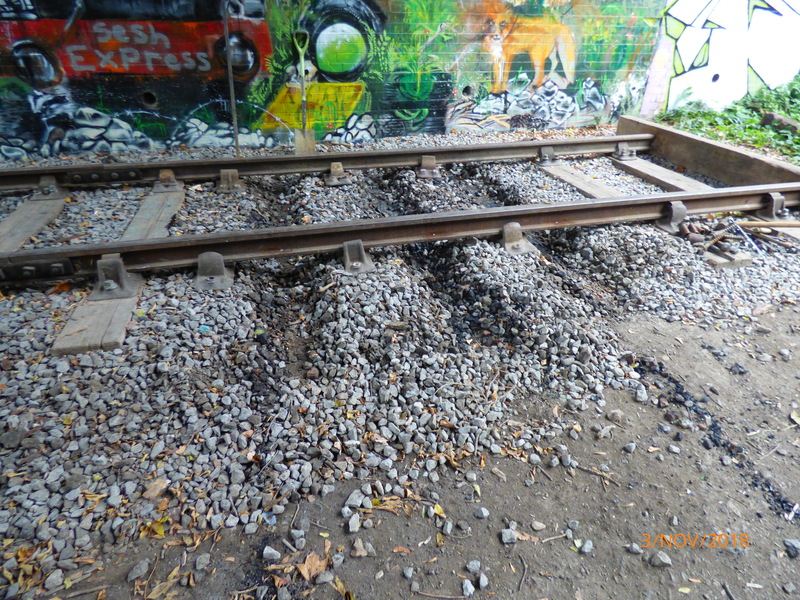 The works were undertaken by a 3-man team using machinery including an excavator and a dumper. The on-site works were completed in a full week (Monday 8am to Friday 5pm), and there had been considerable preparation and collation of the materials beforehand. The works were supervised on-site by a member of the Friends-of group who had specialist knowledge of landscaping, and of the repair of farm dams in Zambia. Approximately 20 hours of supervision was provided throughout the week because frequent decisions were required as the job progressed. 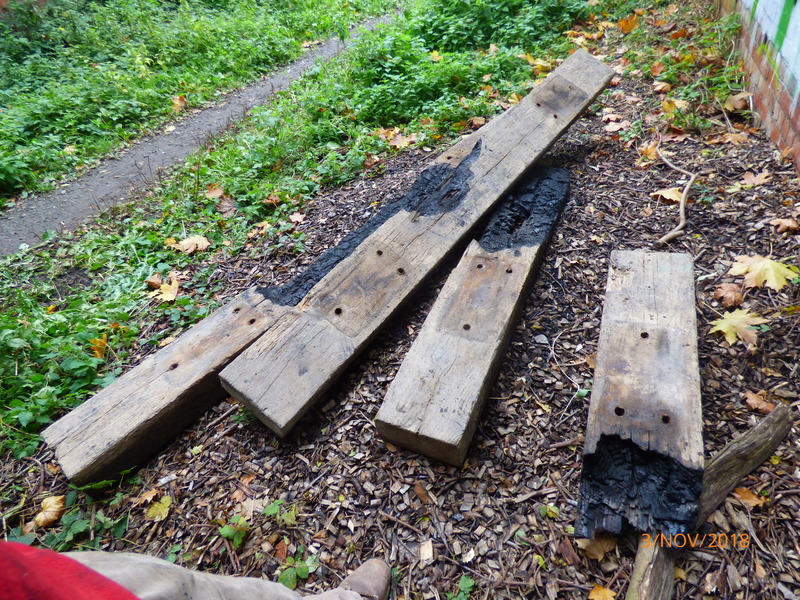 The Friends-of group had had the good fortune to be offered a job lot of pre-used, grey, plastic, boardwalk sections which had formerly been used at Coombe Hill Nature Reserve, by The Gloucestershire Wildlife Trust. 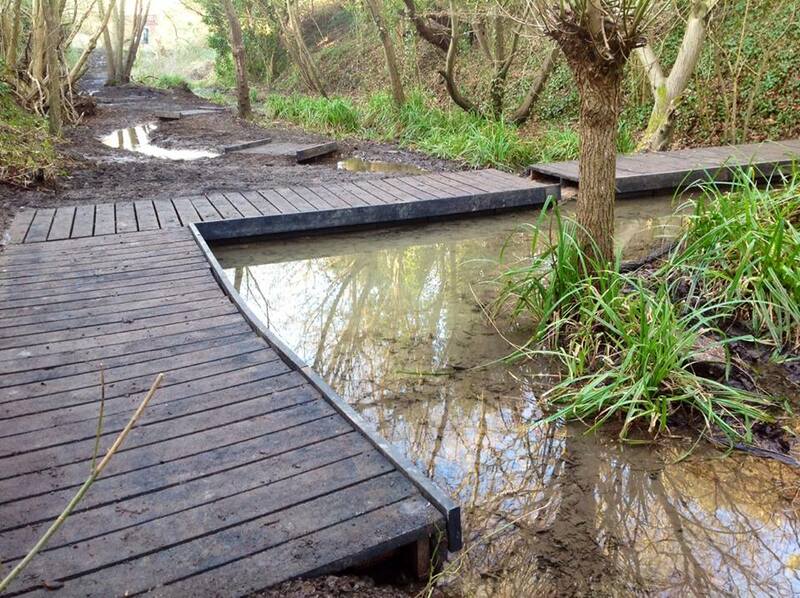 In the floods two years ago the walkway which they had formed had been washed-away and the damage sustained to it was such that the sections of which it was comprised were no longer suitable for use other than on a smaller scale project such as this. As planned and drawn-up by MHP Design, Chartered Landscape Architects of Cheltenham1 the works comprised the removal of parts of the existing ad hoc dam (principally the water-side edge which has been subjected to wear and which had had to be reinforced from time-to-time) and its replacement by a continuous oak board. This was then sealed into the existing structure with clay which was excavated from a location close to Pilley Bridge and brought-in by dumper. The 1.2m-wide boardwalk was installed across the full width of the dam, and on the south side (the right looking upstream) an additional 5m section was installed along the edge of the pond. This additional section (“the return”) now gives access to a greater area of the water, and also to the upper parts of the pond which had been largely inaccessible to all but more-able scramblers until then. It was decided to install the return in such a way that its line reflected the slight, convex curve of that side of the pond. 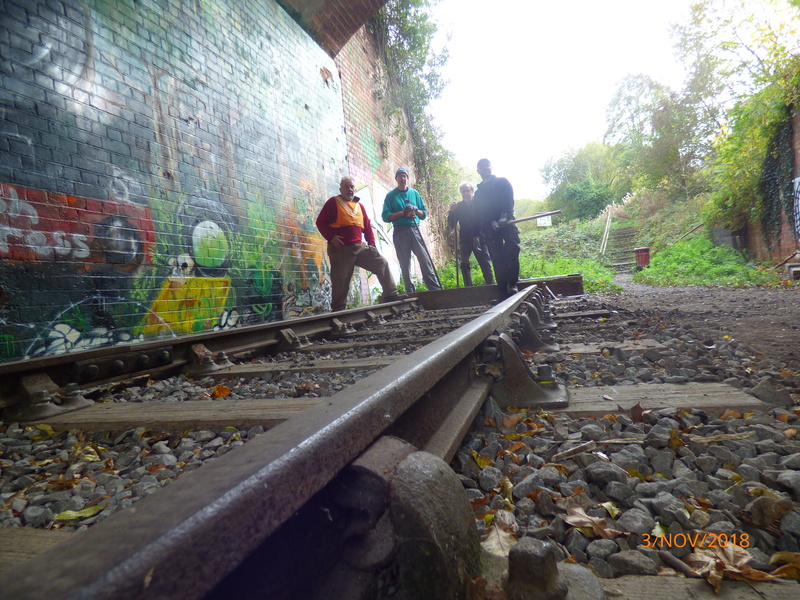 The contractors successfully installed the rectangular plastic sections with a slight angle in the centre of the run, which was challenging but has proved to be visually most effective. A tractor-mounted auger was used to make holes for the wooden posts of English Oak (15cm x 15cm) which form the foundation of the boardwalk. 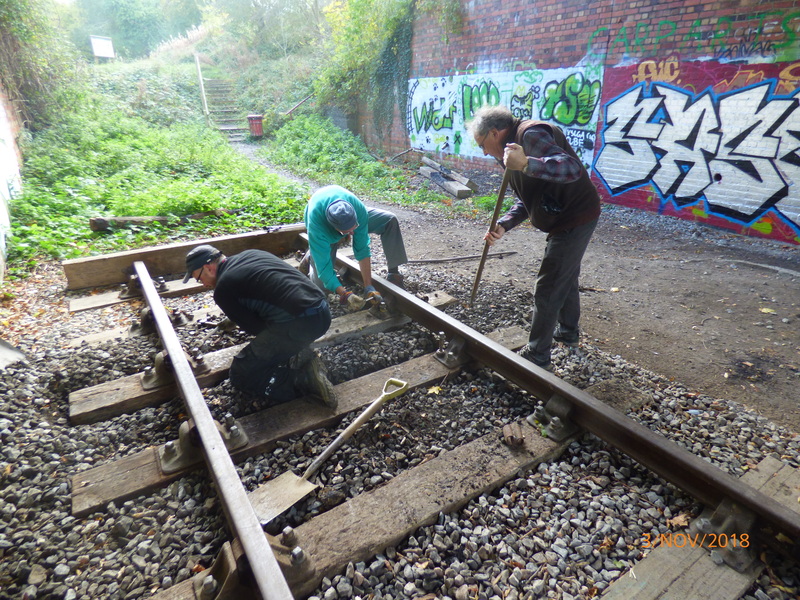 A tractor and auger was required because the buried ballast of the former railway had prevented a previous attempt by the Friends-of group to install posts to strengthen the dam using hand tools. On the downward side it was possible to secure the posts into the ground with concrete, while the posts within the pond (the boardwalk extends over the edge of the dam by approx 20cm) were placed into augured holes and rammed downwards until they were firm. In this way it was not necessary to drain the pond, or to lay concrete within it, both of which would have been harmful to the wildlife. An oak rail was screwed to the outer edges of the lines of oak posts and the boardwalk sections were fitted over these and secured to them. The resulting structure is without movement and constructed of the most durable materials. In strengthening the dam, provision has been made in due course to raise the level of the water, which is currently about 15cm below the level of the boardwalk, by about 7.5cm. This simple procedure will be undertaken during the summer when the flow of water is reduced and it can be stopped for sufficient time for fast-curing cement to harden. This will increase the area of water and make it more accessible, more especially for children. Two, simple oak benches have been ordered from a local craftsman and will be installed by the Friends-of group in due course. Three small bridges were constructed, two crossing the stream (which splits into two creating a small island) onto the new island and off again just below the dam, and a third where the path crosses water issuing from a spring. The bridges are of the same construction type and are sufficiently wide to take a pushchair/buggy. These various access arrangements provide a destination and access to nature for people of all ages. 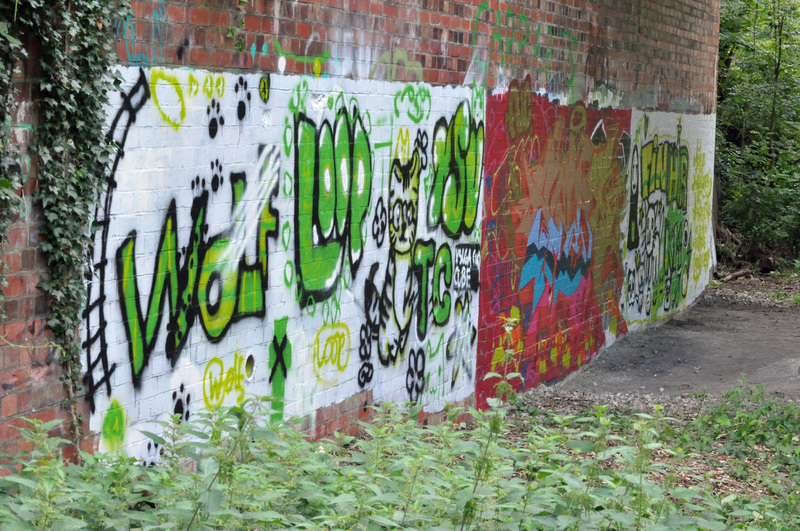 It is frequently remarked upon by local people who have lived in the area often for many years and have just “found” the place2 that PBNR is a strangely peaceful and most agreeable spot to find within the town. Where before the dam was an unsatisfactory, ad hoc collection of earth and boards3 there now is the chance for children to sit or lie safely and in comfort on the boardwalk and pond-dip and watch the pondlife, with benches for adults to rest while they do. It has become a desirable destination which will attract people of all ages for quiet recreation. The path above (east of) Pilley Bridge, across the meadow, has been laid with bricks to provide a mud-free path 1m wide across a stretch of ground which had previously been passable in winter only by determined walkers in Wellington boots. The bricks were laid as a temporary measure in early winter to provide access through the winter using mostly low grade bricks (stocks) which are liable to corrosion by frosts. 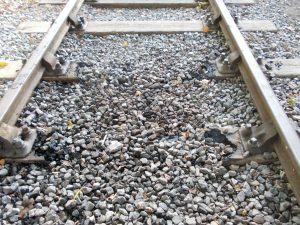 Plans are being made to up-grade the path during 2015 and purchase of engineering bricks to substitute for the stocks will soon be made. This will include adding drainage and a bed of sharp sand; it is anticipated that the outcome will be an all-weather path which will have an indefinite lifespan. The stream now flows out of the pond down a newly-constructed spillway which has not been covered by the boardwalk; it remains a place for children to experiment with hydraulics and further to experience wild things. The boardwalk return (on the south side of the pond) provides access to both the side of the pond and to the marshland upstream which previously had been inaccessible. The marshland is a significant habitat in itself and it is hoped to be able to install an information board regarding the wildlife values of it and the ponds. Works have been started, with the agreement of Cheltenham Borough Council rangers, to increase light levels to the pond and surrounding area by coppicing of the undergrowth, principally Hazel and Goat Willow. This should increase wildlife within and around the pond and provide further opportunities for recreation and study. While the Saturday work party was doing the work4 an early butterfly visited a newly-created patch of sunlight over the pond that had not been there the previous day. Works not yet completed but which are within the funding package, apart from up-grading of the path across the meadow, are improvements to the section of path from the meadow to the ponds. This section remains unimproved because the contractors needed to drive their vehicles over it repeatedly and it would have been damaged in the process. 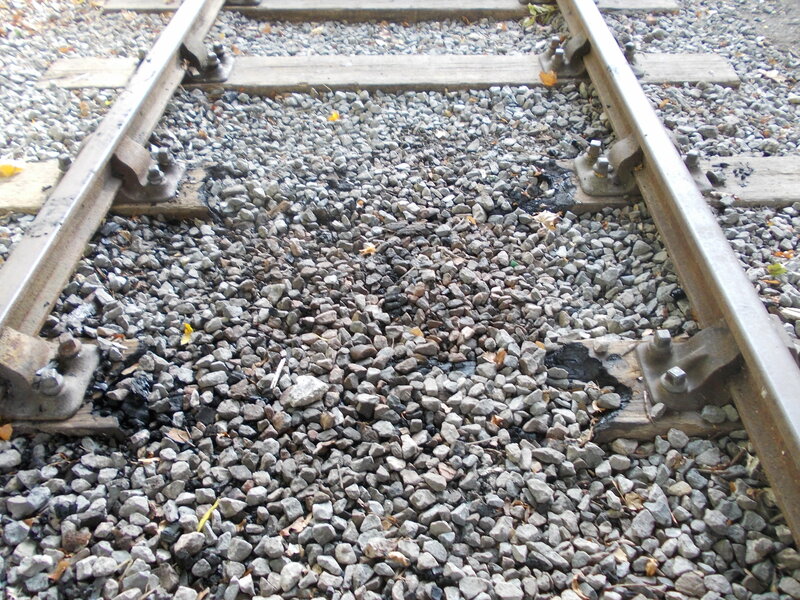 The plan is to use the stock bricks which will become available when engineering bricks are substituted for them, to create a good all-weather path which will then be topped with gravel. 2 It is remarkable how many people are met by members of the Friends-of group who say this. 3 Create a few years ago, most commendably, by the Cheltenham Borough Council rangers in haste to re-locate stranded amphibians. 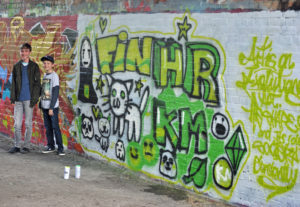 4 The Friends-of group has a once-monthly work party in a Saturday morning which is well supported by up to 15 people. Last year we were lucky enough to get hold of a lot of second hand board walk sections, and thanks to a small grant we have now had some of this installed around the main Pond towards the South-Eastern end of the reserve. It is hoped that this will provide easier access to observe the abundant activity that ponds support. 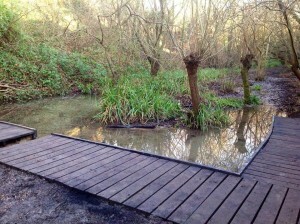 Educational pond-dipping should also be much easier, as the boardwalk gives a clean, stable edge to work from. The observant may notice that considerable pruning happened during the work party just one day after these pictures were taken! The trees are hopefully fully awake for spring after an enthusiastic session of singing and pot-banging in the Orchard. 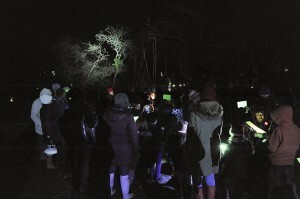 Led by the Woodcraft Folk around 50 people got together to make some noise and enjoy hot soup as a prelude to spring arriving. Back in May, Harry Dennish, and undergraduate intern with the council, started a detailed survey of the plant life in and around the Pilley Bridge Community Orchard (PBCO). He has now produced his PBCO Management plan 2014 and an amazing collection of images (see the ‘Galleries’) tab on any page. This report not only documents the extensive variety of species present, but will act as a baseline to assess future development in and around the Orchard.